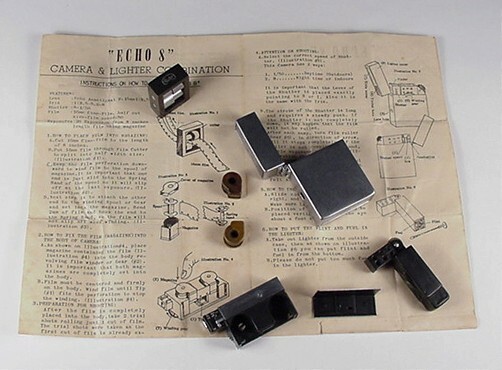 The Echo 8 Lighter-Camera is a disguised subminiature camera manufactured by Suzuki Optical Company of Japan between 1951 and 1956. 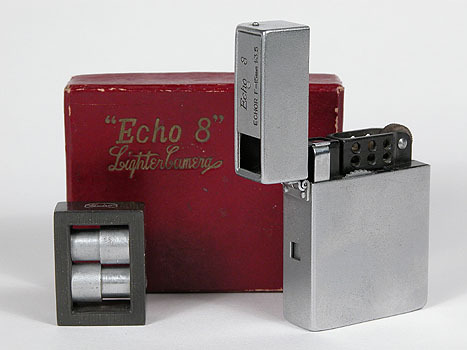 The Echo 8 camera is housed in a fully-functioning cigarette lighter case. The Echo 8 can be considered a novelty camera, or a clever and quite usable spy camera. It takes 20 6 x 6mm exposures on an 8 inch load of 8mm single-perforated film. The Echo 8 camera is shown with its box and film slitter. The film slitter is an accessory used to cut strips of 16mm film down to the 8mm size required by the camera. 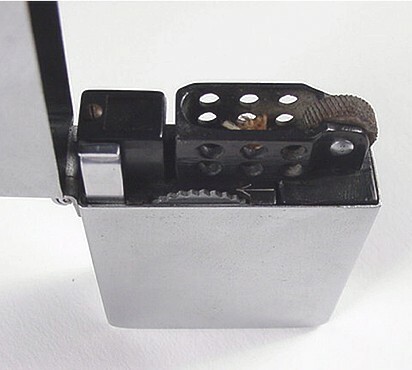 In the photo above, the lighter lid is raised and the sliding viewfinder cover is open. The camera is sited by looking down into a waist-level viewfinder that peers out of that square hole in the lid. To uncover the waist-level optical viewfinder the Echo 8 nameplate is slid to the right. 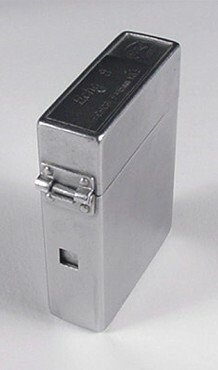 That square hole in the side of the lighter case is the only tip that this is not just an ordinary cigarette lighter. Behind the hole, a cover plate protects and conceals the camera lens. The plate retracts as the shutter release is pressed. 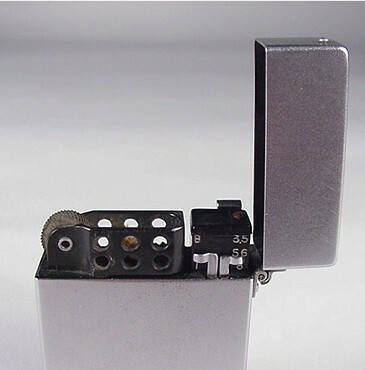 This image reveals the fully functional lighter mechanism, shutter speed selector for instantaneous (1/50 second) and bulb exposures, and the aperture selector. The lens aperture can be set to f3.5, 5.6 and 8. The lens is an Echor Anastigmat of 15mm focal length. Focus is not adjustable. I'd like to pass along a tip to fellow Echo 8 owners - do not fill the lighter with fluid. Resist the urge to demonstrate the lighter to friends and family. Perhaps one third of the Echo 8 lighter cameras I've owned and seen over the years were ruined beyond repair because over time, fluid seeping from the lighter decomposed the cast metal camera body. The chrome lever next to the lid is the shutter release. The serrated wheel adjacent to the shutter release is the film advance. The film advance automatically stops when the film has been wound to the next frame. After the 20th exposure has been taken, the advance wheel turns freely. This is how you'll know you are at the end of the roll as the camera does not have a frame counter. A professional spy should be able to disassemble and reload/refill his Echo 8 in the dark. That black box on top of the camera body is the waist-level finder. The viewfinder objective lens can now be clearly seen. To load film, a chrome plated cover is removed from the camera body. 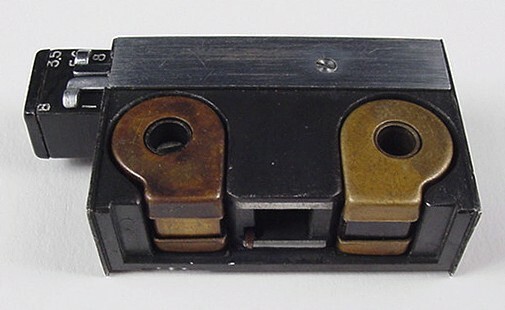 This image shows the two reloadable film cassettes. It was not necessary for a photographer to load their own film. Loaded cassettes could be purchased for 35 cents each, or 10 for 3.00 US dollars. Now, how do I get this thing back together? 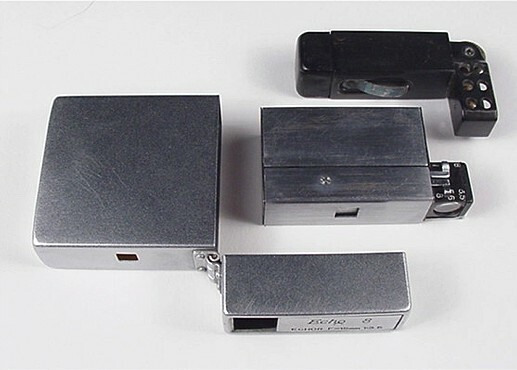 If you would like to see a Nikoh Minimax-Lite lighter-camera ca 1980, follow this link to the Minimax-Lite page.